Being that I am Canadian, I’ve titled this post Remembrance Day Activities but all of these ideas can apply to our US friends as well for Veterans Day Activities. Both of these special days fall on November 11th. Click here to read more about Remembrance Day or here to read more about Veterans Day. These holidays are a special time to remember those who have served for our country. It is a day to pay respect to those that have helped (and are still helping) protect us and fight for our freedom. There are many Remembrance Day activities that your kids can be involved with to celebrate this special day and honour those who have helped protect us. You could create a wreath as a family craft to hang on your front door to symbolize your appreciation. Your children could write a letter to thank those who have helped protect us. In Canada, here is a link to where these letters can be sent. In the USA, here is a link to where these letters can be sent (there are Veterans services listed by state). 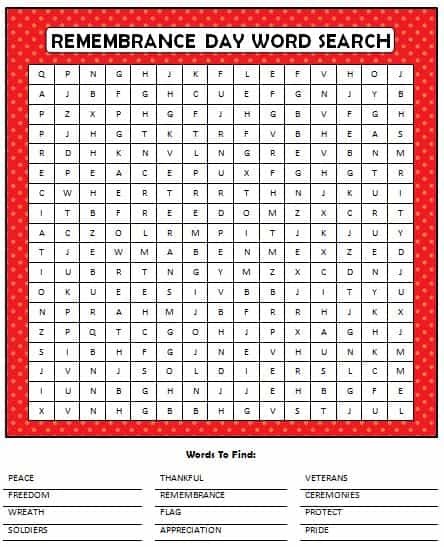 You could teach your children a little bit more about Remembrance Day or Veterans Day while they complete a fun activity like this free printable word search puzzle. Does your family have any Remembrance Day Activities, Veterans Day Activities or traditions to honour this day? For more fun ideas for the holidays including party ideas, free printable games, activity ideas and more – visit our special Holiday Fun page. The holidays are all sorted by month so that they are easy to navigate through. You can also stay updated on the latest ideas for family fun by joining our community on Facebook, Pinterest and Twitter. We have a combined community of over 22,700 and we’re growing daily. Be sure to say HI when you join so we can give you a proper welcome! Great activity ideas! It’s so important to remember our veterans. I would love to send letters, I’ll just have to wait for my boys to be a little older. Thanks for the tips!! I so need to make a wreath! This is a great way to get kids interested in Veteran’s/Remembrance Day!